Sky Editor is a plugin-based multi-tool for Mystery Dungeon games. One of the plugins allows for the editing of ROMs, and this tutorial will show you how. Before we begin, let's understand how exactly Sky Editor works. 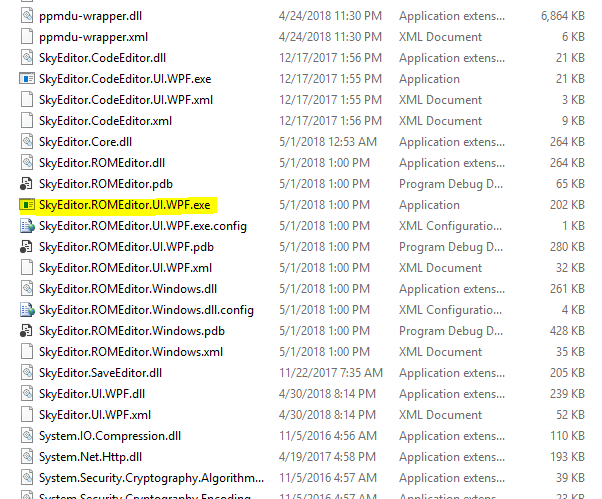 Most ROM editors simply edit the ROM, leaving you to create distribution patches on your own (because distributing the full ROM is a breach of copyright). 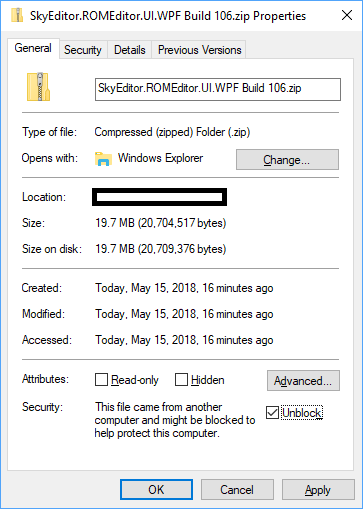 Sky Editor takes care of this for you, creating a zip file that contains all of your edits, along with a patcher that can apply those edits to another clean ROM. This zip file is called a "mod pack". Mod packs contain one or more "mods". When patching your ROM, you will be given the option to enable or disable each mod. For example, if a mod pack a mod that changes the available starters and another mod that changes the main menu backgrounds, you can choose to apply both, or you can disable the starter mod so you can enjoy the new backgrounds. Or you can leave the backgrounds as-is and enjoy the starter mod. While Sky Editor is primarily intended to edit ROMs for Pokémon Mystery Dungeon, it can be used for any NDS or 3DS ROM (more on that when I write about the Generic Mod). US and European ROMs generally work fine, but Japanese ROMs might have issues in some cases. All other NDS and 3DS games can still be used if you would like to create a distributable patcher for edits made using external tools. Windows with the .Net Framework 4.6.2. Mono will not work. Java, if you want to edit scripts or starters for Pokémon Super Mystery Dungeon or Pokémon Mystery Dungeon: Gates to Infinity. A beefy computer or lots of time. I don't know what the minimum specs are, but the better computer you have, the faster things will run. Go to the latest successful build on Team City. 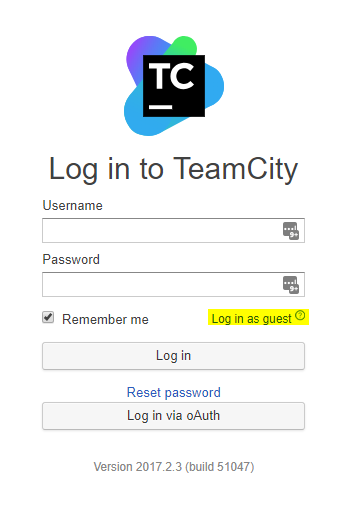 Click "Log in as a guest". Download the file with the ".zip" extension. 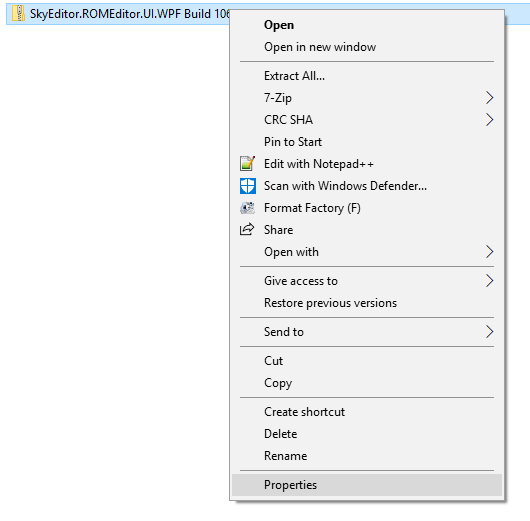 In Windows Explorer, Right-Click the zip file and click Properties. Click or check Unblock. It may either be a button or a checkbox. Extract the zip file with your favorite zip extractor. I use 7-zip, but any zip extractor should do. You should now see the main Sky Editor window. If you do not, please let me know in the comments section below. 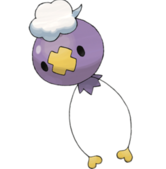 System.InvalidOperationException: There is an error in XML document (37, 206). ---> System.Xml.XmlException: 'AutoHideMinWidth' is a duplicate attribute name. Line 37, position 206. System.NotSupportedException: The invoked member is not supported in a dynamic assembly. I'm trying to uninstall the update and see if that helps, but its running updates in the background and I can't turn it off yet. Do you have any ideas what this could be? Try deleting AvalonDock.Layout.config. Sounds like it got corrupt somehow. System.UnauthorizedAccessException: Access to the path 'Resources' is denied. It looks like you have Sky Editor somewhere you don't have write access to, which is strange considering it's on your desktop. Try moving it somewhere else maybe? bear with me here, as I'm a total noob, but for some reason, when I downloaded the application and followed the instructions, the exe file wouldn't work. I figured it was the .NET framework, but when I tried to download that, it said I already had it, or some higher version. Any idea how to make it work?